All of my freshman world studies students began working on their group unit films for The Enlightenment today. In the past they have made Common Craft style videos, this time I gave them the option of making RSAnimate style videos as well. This would obviously lead to my students making similar films, based on the content we are covering in class. The Setup: I usually structure my class to spend two to three weeks gathering content and background knowledge, then I set them loose for about a week to create something collaboratively to demonstrate their understanding. That being said, here is the project outline. Day 1: Get into groups, go over the assignment & begin to plan. I give my students storyboard sheets that allow them to plan the image for each scene with notes below. They also have another script sheet that allows them to completely write out what they will say in each scene. I did some setup on day one as well. 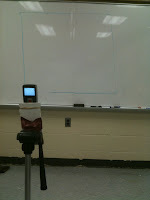 While the students work, I rigged the tripods to allow a flip camera to be attached. Day 3: Dress rehearsal - the students have to walk through their entire film, iron out any problems and fill in any gaps. 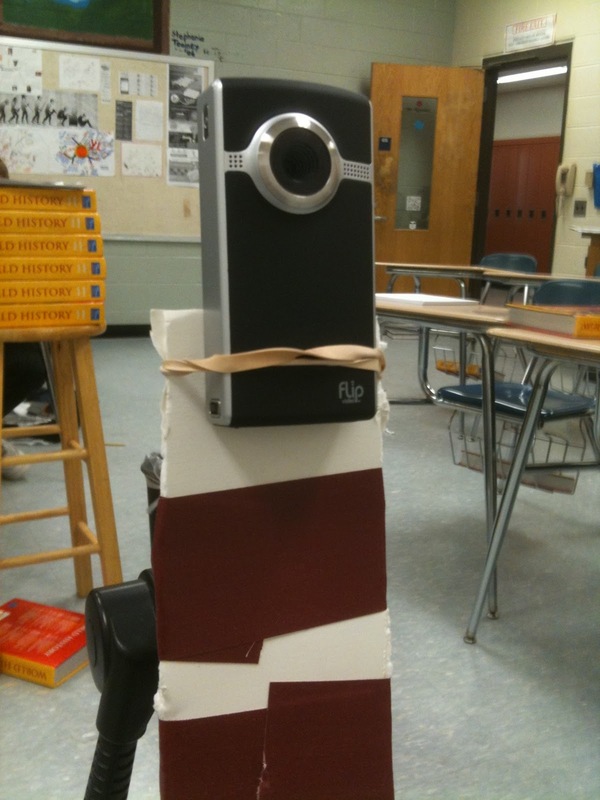 Day 4: Film - I have tripods that I have modified to allow flip cameras to be attached with a rubber band. Three groups will be filming on my big dry erase board in the front of the room, and I borrows some big dry erase boards from a science teacher who uses them in his physics class to do $2 Interactive White Boarding. Once the video has been shot, I will import the video clips from the flip cams into imovie. The audio from the original video is then removed from the footage and the clips are edited together. The final video footage is then sped up to run 2 to 3x faster than the original footage, this give the video the appearance of extremely quick writing & drawing that can be voiced-over later. Day 5: Voice over - Now that the audio has been removed, it is time for the groups to voice over the footage. In imovie, you have to simply click on the small microphone icon, click on the selected clip and start recording. This will probably be the most difficult part because I have one Macbook Pro and every group will have to voice over one at a time. I'm sure there is a faster way to accomplish this part of the project, if anyone has any tips for the voiceover please let me know. When the final projects are done, I will be sure to add them to this post! UPDATE: One group was on the ball this week and after only two days of prep they were ready to film. The filming took about 25-30 minutes and we haven't done the voice over yet, but the girls were thrilled with the rough cut. Thanks for posting how you broke this type of video up for your class. I was inspired by the RSA type of video too and would love to do this type of video with my own class. I look forward to seeing your final products on You Tube. Thanks for the comment Joanna. I'll be sure to post an update when the finished products are up on youtube. Stay tuned for the update! Greg, love what you are up to! I run DetentionSlip.org, and we are currently promoting a contest for Vocab Videos you might be interested in. If you enter this with students, let me know and I will feature your entry on the front page. Great Idea. I look forward to the final versions, and would love to do something in my class like this. I think it would work well with literature as well. This is great Greg! Did you have a formal rubric to go along with this project? If so, would you mind sharing? I don't recall a specific rubric, but I recommend using http://digitales.us/evaluating-projects/scoring-guides (Digitales) to create customized rubrics based on student created multi-media content.